Agustín Fernández Mallo is a physicist who, in his Nocilla Trilogy, has been writing the universe as understood by contemporary science into novel form. Nocilla Dream and Nocilla Experience are structured as networks of themes, images and ideas, without a traditional anchor-point around which to revolve. Now here’s the third part of the trilogy, Nocilla Lab, which takes what Dream and Experience did with the world at large and applies it to notions of individual identity – in this novel, it’s the protagonist who is without centre. First off, let me say that this is a brilliant translation by Thomas Bunstead: Nocilla Lab is divided into four sections, each written in a distinct style, yet with subtle interplay between them. The first part is (bar a few quoted passages) written as a single sentence over seventy pages. In this section, the narrator (Fernández Mallo himself, or a version of him) describes visiting Sardinia with his girlfriend, to work on what he refers to mysteriously as their “Project” (which they later abandon). The narration here is propulsive and disorienting all at once, looping back on itself and weaving together past and future. But there’s also a certain rawness to it, a sense that these are thoughts coming straight from the narrator’s mind. One of the ways this theme plays out in Nocilla Lab is by undermining the idea of the protagonist as an individual with a coherent identity. The novel’s second part takes place in recognisably the same situation as its first, with (one is given to assume) the same characters. But the prose is more conventionally novelistic, which makes this section feel different – more distant, more settled. The narrator and his girlfriend come across an old prison which has been turned into an eco-hotel (albeit mainly so the proprietor can keep himself to himself, rather than with the intention of having many guests). What initially may seem quirky turns darker when the hotel owner claims to be named Agustín Fernández Mallo, and working on a Project similar to the narrator’s. Up to now, the events of Nocilla Lab could pretty much have passed for real life, but this… this is the sort of thing that happens in a novel, so it’s only fitting that it’s related in prose that reads like a novel. But this turn of events also raises the question: who is the narrator? Can we trust him to be the same individual in the second part as he was in the first? This question becomes even more pointed in the novel’s third section, a typed manuscript, because here the narrator has assumed the hotelier’s identity and apparently let go of his own previous one. There’s continuity of narrative between the novel’s parts, but the sense of a single ‘I’ behind it dissolves. The form taken by each of Nocilla Lab‘s sections also moves us progressively further away from the narrator. By the fourth part, we’re firmly on the outside looking in, at a comic strip. The protagonist here looks like Fernández Mallo, though when asked who he is, he replies, “Not sure.” This individual travels to an oil rig where he meets the writer Enrique Vila-Matas, who tells a story. Two men hear similar noises: one is being kept awake by his watch, the other a prisoner about to be set free. The same thing means something very different depending on the context – rather like the narrator, who changes with the scene, until he disappears within versions of himself. I must mention MacKenzie Warren’s excellent review of Nocilla Lab at Splice, which helped clarify some of my thinking here. 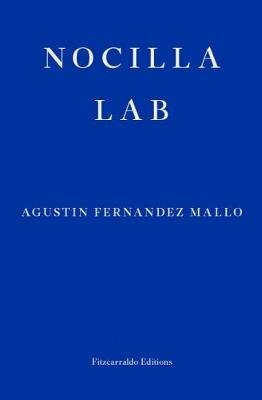 Nocilla Lab (2009) by Agustín Fernández Mallo, tr. Thomas Bunstead (2018), Fitzcarraldo Editions, 192 pages, paperback (source: personal copy). This is the follow-up to Nocilla Dream, which I reviewed on the blog previously. Nocilla Experience is a thematic rather than a direct sequel (would it ever have been direct?). The format is broadly the same: short chapters mixing vignettes of characters (some connected) with apparent non-fiction (that may be adapted or even invented). As before, the effect is of a novel — a reality — without an anchor. A set of pieces that float freely, now coming together, now drifting apart. The key difference, to my mind, is that Nocilla Experience is more concerned with ideas and where they come from. So, for example, we’ll meet characters with grand ideas — about art or the nature of the world, say — but the book’s overall structure will suggest that each is one idea among many, of no greater significance than the rest. The overriding image is that of a radio playing to nobody, in an empty palace devoted to a particular board game. Individual ideas, the book seems to suggest, are ultimately no more substantial than that palace. I won’t sit here and pretend that I grasped everything in Nocilla Experience. But it’s not about grasping everything — it never is. Sometimes I need to read a novel that requires me to reach up. Sometimes I need to see that the form and horizons of fiction are limitless. A version of this review was originally published as a thread on Twitter. 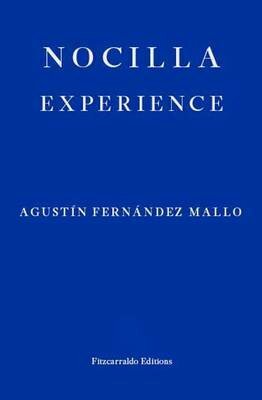 Nocilla Experience (2008) by Agustín Fernández Mallo, tr. Thomas Bunstead (2016), Fitzcarraldo Editions, 200 pages, paperback. 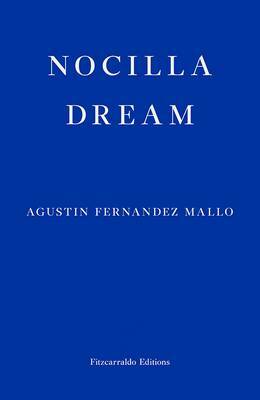 The author bio tells me that Agustín Fernández Mallo’s ‘Nocilla Trilogy’ (of which 2006’s Nocilla Drream is the first volume) was instrumental in bringing about an aesthetic shift in contemporary Spanish writing. Now we get to read Nocilla Dream in English, courtesy of translator Thomas Bunstead and Fitzcarraldo Editions; and you can see why this novel must have shaken things up. Nocilla Dream has a teeming cast of characters, with hints at a web of hidden connections – and that’s where the similarity with a conventional plot-driven novel ends. Each of Nocilla Dream’s 113 chapters consists of a single paragraph, from a few pages down to a few lines. Some are extracts from other books; some come from New York Times articles; others are snapshots from the lives of various characters. Amongst others, we’ll read about Falconetti, an ex-soldier who left San Francisco with the idea of circumnavigating the globe from west to east; Pat Garrett, who wanders around carrying a suitcase of found photographs; and a community of surfers in south-east China, with its roots in a group of North American expatriates. Many of the novel’s events revolve around U.S. Route 50, with one recurring image being a poplar tree from whose branches people have hung shoes. Trees in general are a common metaphor throughout the novel, particularly in terms of the idea that branching networks underpin reality. On the reverse of one of the cuttings, he’s come across a picture of an elderly painter, clearly from the West, distinguished looking, with slicked-back hair and moustache, apparently at work in his studio. What he cannot understand is that the room the painter is standing in is full of paint pots with great daubs of paint on them, that the floor has daubs of paint across it too, that there are lots of different brushes resting in white spirit, that the painter is wearing a paint-spattered smock, but that, without soiling it in any way, he’s working on a blank, spotless canvas, and he’s using a cutter to make vertical slashes, nothing more, vertical slashes. Chii-Teen suddenly becomes very excited, considering the possibility of a body without a mind, the possibility that the studio, the smock, and all the dense mass of painting materials could be a body that has been separated from the pure mind, Cartesian, fleshless, I,e. the blank canvas to which the painter is applying the cutter to. This passage establishes a hierarchy of realities: the character in the fictional present looking at a two-dimensional image of the past (and, in turn, the reader apprehending fictional reality on the page). It illustrates a shift in context, as the slashes in the canvas, which clearly would have been meaningful to the artist making them, become unknowable to Chii-Teen. And there’s a fleeting sense of hidden order. The thing is that, for every glimpse of a deeper meaning to reality in Nocilla Dream, there’s a suggestion that what we sense is illusion. The connections in the novel are those of globalisation: not necessarily visible from the ground, but neither indicative of a meaningful structure. Reading Nocilla Dream is the experience of a novel – like the world it depicts – without a centre: slot the pieces together as you will, but what you end up with is no more stable than one of those fragments. Read more views of Nocilla Dream at 1streading’s Blog, Workshy Fop, and minor literaure[s].